Though it’s been over a month since Mike and I returned from Puerto Rico my blogging about the trip has been sadly lacking. 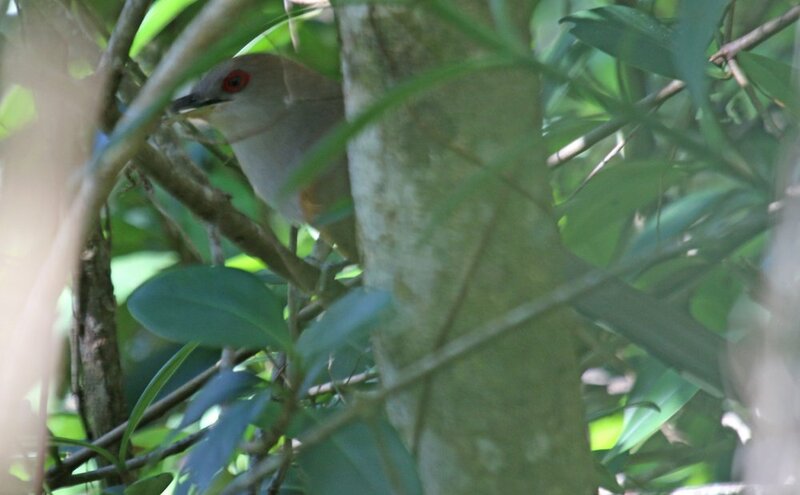 I’ve only covered the first day of our sweep of the island’s endemics (in this post and this one) and some images of Mangrove Cuckoos. There are still three-and-a-half more days to cover! 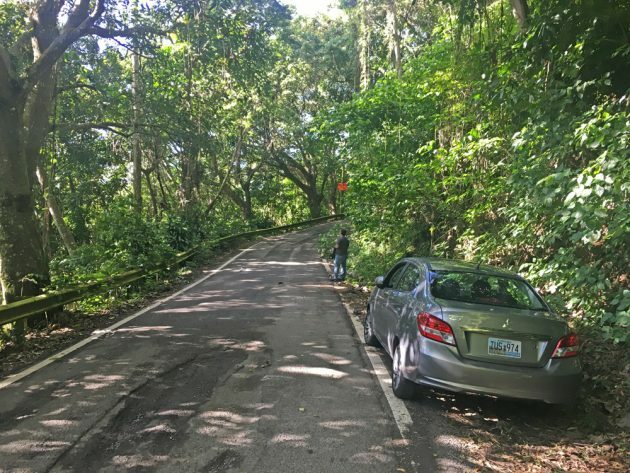 Here, then, is coverage of the first half of our second day in Puerto Rico (16 January 2017), the day that our trip turned from near disaster to total victory thanks to a headache and a serendipitous stop on the side of the road. What am I talking about? Read on, reader, read on, and I will do my best to explain. 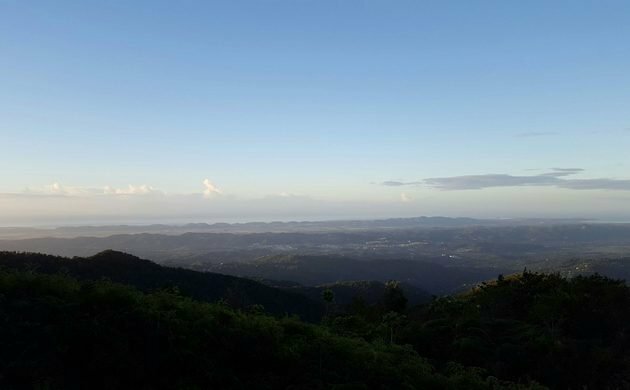 We started our morning in Parguera and headed out, pre-dawn, towards Bosque Estatal de Maricao, the Maricao State Forest for those of you who are not familiar with Spanish. We serendipitously found an open bakery en route where we got coffee and a variety of baked goods before making our way, with the help of Google maps, to our destination in the highlands. For the record, and as Seagull Steve has already pointed out, you should ignore Google maps if trying to get to Maricao from the south, and instead just get to Sabana Grande and take Route 120 all the way there. We ended up taking a very convoluted route thanks to Google though we did make it to our destination eventually. Yes, this is the best shot I got of a Puerto Rican Tanager. Fortunately, they are not terribly attractive birds so you aren’t missing much. Just before we reached the car we found a single Elfin-woods Warbler that barely cooperated for us both to get on it but the looks were lousy and hardly worth counting. Still, a target bird seen is a target bird seen and we were slightly more optimistic as we headed into town. Mike quickly got us to Maricao, found a gas station that sold both gasoline and painkillers, and provided me with my head-saving drugs. It was probably the placebo effect but I immediately began to feel better. We headed back to the state forest and drove slowly along Route 120, looking and listening. At milepost 19.9 we spotted a small bird fly across the road. While stopping to look for it we heard what we were pretty sure was a vireo. The habitat looked good, there was a spot we could pull over without being in the road, and we had no better ideas, so we stopped the car got out and birded the edge of the road. And are we ever glad we did! Mike looking for birds by mile post 19.9. The habitat was really good here. In quick succession we added Puerto Rican Vireo, Puerto Rican Emerald, Lesser Antillean Pewee, Green Mango, Puerto Rican Bullfinch, Puerto Rican Spindalis, and another Puerto Rican Tanager to the list. It was like bird-manna from bird-heaven raining down on the bird-believers’ heads. Endemics and lifers galore! From that moment on we were never again worried about getting all the endemics on the trip as it seemed destined that we would do so. 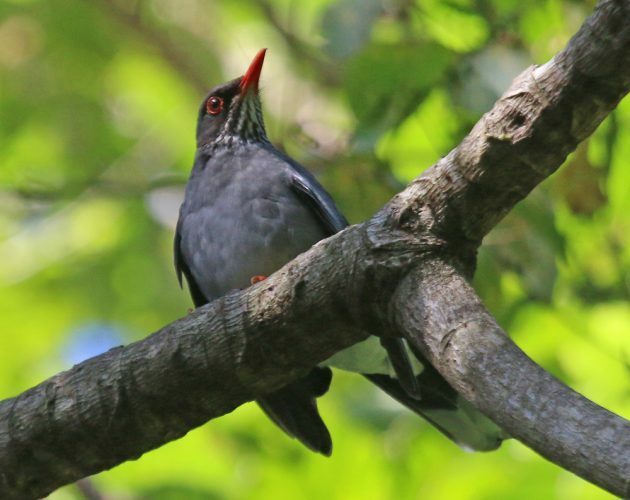 Somehow, despite the number of endemic birds to be seen, I managed few good pictures at our miraculous stop. 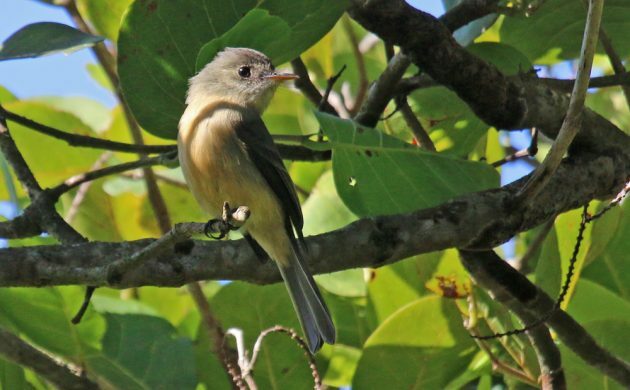 Instead, enjoy this Lesser Antillean Pewee from further up the road and a Red-legged Thrush that stayed still long enough for me to get a couple of passable shots. Before too long the bird activity petered out and we continued up Route 120 looking for another good spot to stop. We found it in the form of the trail that is supposed to be good for Key West Quail-Doves. 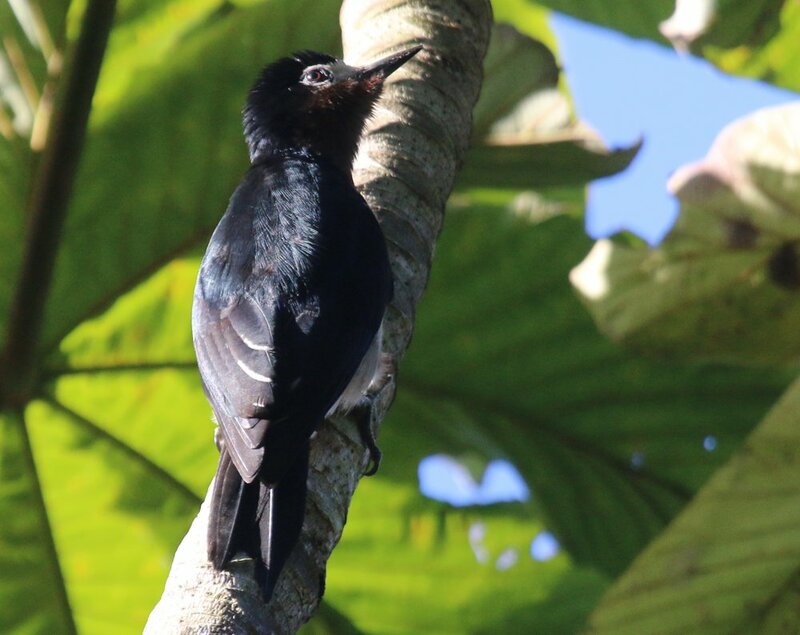 We did not find it to be so which might have had something to do with the fact that it was mid-morning when we birded it, but we did find the trail to be very good for Puerto Rican Lizard-Cuckoos and we finally got the crippling looks we wanted at a pair of these awesome creatures. Though the looks were great and at short range, the photographic opportunities, in thick vegetation and with little light, were not. Below is the best that I managed. We continued down the trail and came across an Antillean Euphonia that we watched for a bit. Other than hearing another a short way down the trail it would be the only one we would encounter for the entire trip. The Antillean Euphonia is a striking bird. This photo does not do it justice. Once we returned to the car and went through our list we realized that we had only one more target bird for Maricao that we needed to find. The Puerto Rican Oriole had thus far eluded us. We returned to our original birding location, the picnic area where we hadn’t seen too much despite the habitat seeming fine and there being a decent trail to walk. We had no sooner started down the trail before we heard an oriole. A quick bit of tape and, yes! Puerto Rican Oriole! In fact, we saw two! 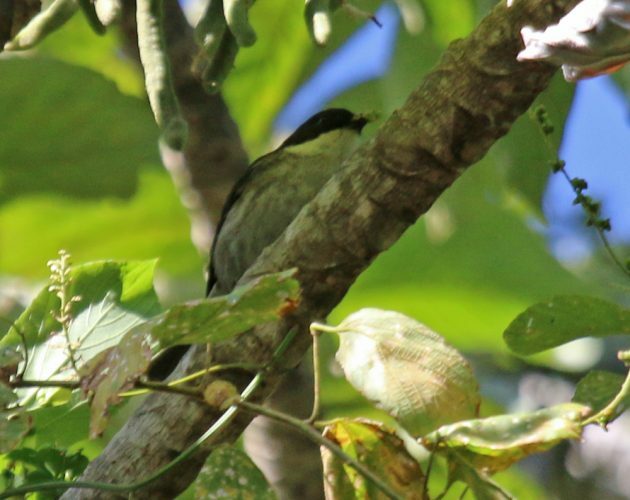 There were only three more endemics left for us to find after Maricao and we couldn’t wait to find them. 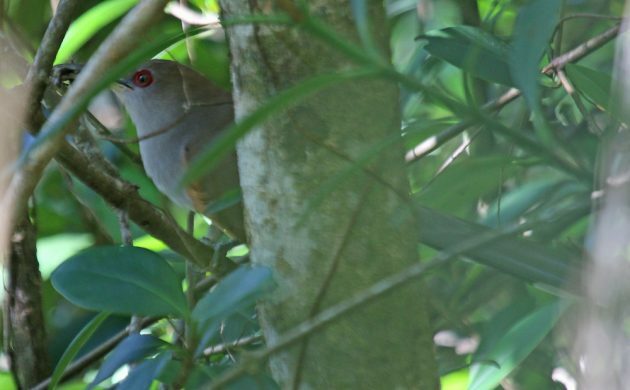 We did take some time to try again to find Elfin-woods Warbler and though we did see another it too was not very willing to stay in sight or stay still for photographs. I’m not sure what was up with that and it will remain a bird of which better views are desired. Before we got back to work looking for another Puerto Rican endemic bird we decided to stop at a roadside lunch spot just south of where Route 102 crosses Highway 2 (just west of Sabana Grande). Lechonera Figueroa had delicious food. Both Mike and I enjoyed the pernil and we would highly recommend a stop there after birding Maricao, especially if you have to get back to Highway 2 or continue south to Guanica or Parguera after your visit to the highlands. 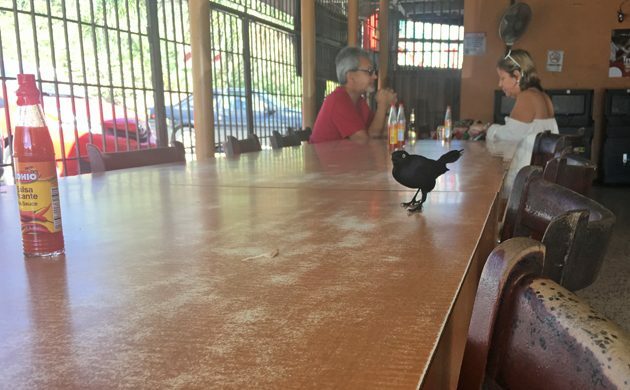 The Greater Antillean Grackles seemed to like Lechonera Figuera as well! 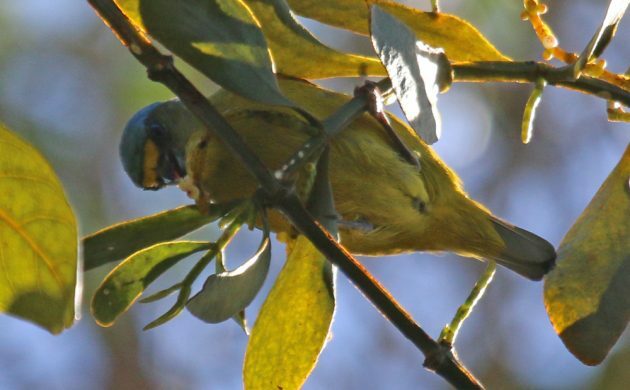 Our eBird list for Maricao is here. We’d recommend leaving yourself several hours to bird the area and if one spot along 120 seems lifeless to move on until you find activity. The birds are up there, you just have to be persistent and keep on birding! This is the fourth in a series of posts about Mike and Corey’s self-guided trip to Puerto Rico from 14-18 January 2017. (You can find the rest here.) Make sure to come back soon for the next installment. That was quite the unplanned side-of-the-road stop!